The DFG51 is being discontinued and will not be available after stock sells out. Please see the DFG55 SERIES as possible substitutes or contact our Pressure department. 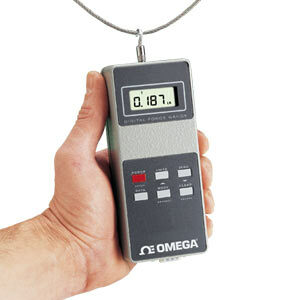 The OMEGA ® DFG51 microprocessor-based digital force gage is small, rugged and lightweight, which makes it an ideal instrument for portable handheld force measurement. The DFG51 has many features which allow it to be used in a variety of applications, ranging from simple push-pull force measurement to being part of a sophisticated system for process control or automated testing. 注: All DFG51 Series come in a cushioned carrying case complete with chisel point, V-groove cone, flat head, hook and extension rod attachments, ac adaptor, certificate of calibration and complete operator’s manual.